The little baby goat on the left is named "Phoenix". He almost died after being stuck inside his momma's birth canal. Behind him, also trapped inside of the mother goat, were his brother and sister. When Phoenix was finally pulled out of his momma, he was completely lifeless. I thought he was dead, but I cleared his nose and mouth anyway, rubbing him vigorously. He slowly came to life, but it took several hours for us to know if he would live. He lived, and he truly is like a Phoenix rising from the ashes. I am lucky to have had many wonderful goat mentors over the years. I have been successfully raising goats for over a decade by using natural, non-toxic methods, and I am now the person that other people call when they have questions about goats... or when their goat has trouble giving birth... or when they need to disbud a baby... or when castration time comes along. Goat raising workshops take place at our farm in Marblemount, WA. 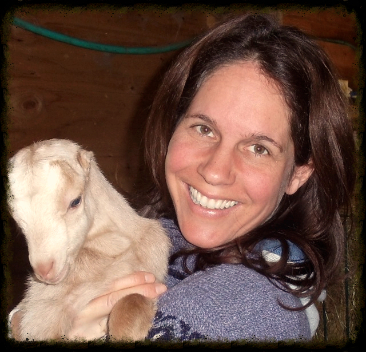 I'm teaching a goat raising workshop on October 16 as a part of our homesteading and wilderness retreat October 15 and 16. You can sign up for it by clicking here. Or you can choose to particpate in only the goat raising segment of the retreat, October 16 from 8:30am until 3pm, including an organic farm-raised breakfast, for $89.